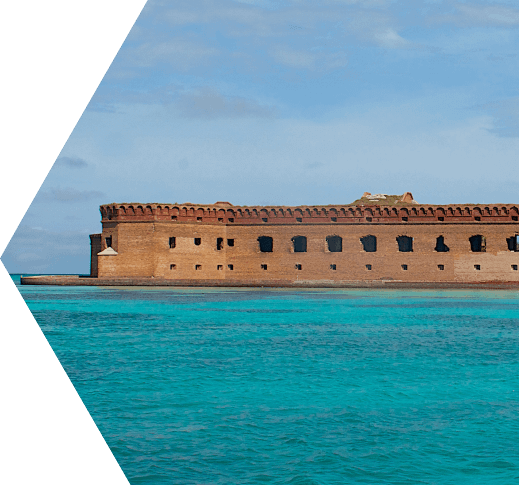 Fort Jefferson’s most famous prisoner, Dr. Samuel Alexander Mudd has left his historical mark on the Dry Tortugas. Samuel Alexander Mudd was born on December 20th, 1833 in Maryland, just 30 miles from Washington, DC. Dr. Mudd began practicing medicine in 1856 after graduating from Baltimore Medical College, currently known as the University of Maryland. After beginning his life as a practicing physician and farmer, Dr. Mudd married Sarah Francis Dyer, and fathered nine children. Dr. Mudd is most infamously known for his involvement in the assassination of President Abraham Lincoln, who was shot by John Wilkes Booth in 1865. Mudd’s first encounter with Booth was less than a year before the assassination, during a discussion regarding the sale of a horse. A month later, Mudd, Booth, John Surratt and Louis Weichman shared drinks in a hotel room rented by Booth. During his assassination of the president, John Wilkes Booth broke his leg and sought the help of Dr. Mudd and stayed at Mudd’s residence until the next day. Mudd was later arrested for conspiracy and for harboring Booth and David Harold after the crime was committed. After standing trial and a string of testimonies, Dr. Samuel Alexander Mudd was convicted and sentenced to life imprisonment at Fort Jefferson in the Dry Tortugas. After a failed escape attempt in 1865, Dr. Mudd was assigned to the prison’s carpentry shop. Throughout this time, Mudd’s wife had been writing letters to President Andrew Johnson in efforts to have her husband released from prison. In the end Dr. Mudd’s stay at Fort Jefferson was short due to his heroic action and leadership during the yellow fever epidemic on the island in 1867. Due to his participation in efforts to help the sick, Dr. Mudd finally received a pardon on February 8, 1869, signed by Andrew Johnson himself in front of Mudd’s wife. He was officially released on March 8th, leaving his mark on the Dry Tortugas and on U.S. history for centuries to come.